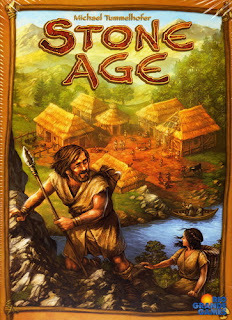 Last night I got in a couple games of Stone Age by Rio Grande Games. The premise is you guide your Stone Age villagers in building up their village. It's got a number of similarities to games like Puerto Rico and Agricola. You place your villager meeples onto certain spots (or jobs) on the board and they collect resources in which you can use to advance your village. Visually a nice looking game with lots of little wooden bits and it took us about an hour and a half with 4 people per game. If you like Eurogames, then I'd recommend this one. Also this past week, I completed a group of 6 figures for a friends X-Wing game. These were from Spartan Games Firestorm Armada range and are a pack of their Communications and Point Defense satellites. Unfortunately I didn't get a pic of them. On my paint table right now is a collection of assorted figures for a number of different units for my NK Egyptians. I need to allocate more time to painting as I'm finding it hard lately to get anything done.